Throughout Islamic history, written correspondence has played an important role. Even during the time of the Last Prophet, Divine benediction and peace to him, it was his way to write letters to various leaders and representatives conveying the Message of God for which he was appointed in his time. After his veiling from the physical world, his spiritual heirs, the saints, guides of heart and soul continued following his footsteps. Mektubat or Maktubat is the common term referred to the letters of sufi shaykhs and scholars. Many sufi masters had extensive written correspondence with their disciples which later became very valuable document both as source of practical spiritual counsel as well as time-stamp that captures intimate conversations, nature of the time and its many flavors. In Islamic tradition the famous Letters are that of Letters of Prophet Muhammad, Maktubat of Shaikh Abdul Qadir Jilani, Letters of Imam Ghazali, Maktubat Imam Rabbani (Shaykh Ahmed Sirhindi), The Hundred Letters of Yahya Maneri, Makatib: Rumi's letters to his disciples, family members and others, Letters of a Sufi Master Shaykh ad-Darqawi, Letters of Said Nusri, Maktobat-e-Sarwari (Faqeer Abdul Hameed Sarwari Qadri), Maktubat Masoomiya of Imam Muhammad Masoom Faruqi Sirhindi, Letters of Sufi Scholar Abd al Ghani al-Nabulusi are names of the most famous ones. In present time the contemporary Sufi Masters continue to write letters, correspondences and notes to their disciple - which by their very nature mostly remain very private. Letters between a Sufi Master and their disciples are often a both way communication because in this medium - it is the letters of the disciple that triggers the flow or transmission by the permission of God. For this reason, letters of disciples are also important. In very recent time thanks to technological advances, other new media are used to exchange correspondence, but nevertheless the principal remains the same. Now a days a number of Sufi Mail group are active on the internet that features letters / written exchanges of disciples of various Sufi teachers, if not the Teachers themselves. 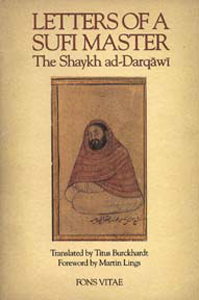 The letters give a disclosure of the inner world of the fuqara and dervishes and their spiritual connection (nisbat) with their master. Below here I would like to share a letter from one of the traveler in the Shadhili Sufi Order who shares his experience with the Shaykh, Sidi Muhammad al Jamal, may Allah bless him and give him long life. The letter is written as an invitation to fellow seekers in an upcoming Sufi gathering. The quality of the letter was different than many other correspondences received over email. Thus I felt moved to share it with you. May this one give you a taste of what it likes to be with the Teacher and what is it like for those for whom the Way has been opened with the Grace of God, the Most High. Subhanallahi amma yushrikun. I hope you're loving it as much as I do. The beauty of the Fall, though perhaps somber, has a way of weaseling its way into my heart. Yet its magnificence, its beauty and subtlety, are just a tiny slice of Allah's immense miracle. There are so many blessings that we, finite creatures that we are, can't help but take for granted most of the time. Salih Kent once commented that if we made a point of trying to list all the things we have about which to be grateful, we couldn't. He said we could spend the rest of our lives reciting our blessings and never reach the end of the list. It's really true. The blue of the sky, the cool breeze against one's cheek, the warmth of a friend's heart, and on and on and on. Allah truly is most generous. In this, a reminder about Sufi School Southwest, I want to start off by saying I don't know whether or not you should be there. Only Allah knows. Allah is the wise. He is the generous. Each year, when I check into my heart, what's moving is different. One year I was like a groupie, following Sidi to the Land (several times), to Austin, the Farm of Peace and then back to San Diego. Other years, I've felt moved to be with him just once or twice. This year, it was Portland (for the very first time but, insha'llah, not the last) and now San Diego (yet again) -- my new and old regional communities together in my heart. Every time I've been with Sidi, it's been amazing. Sometimes the jamal, sometimes the jelal, but always wonderful. After a whole string of peaceful, expansive, beautiful khalwas in the last year or two . . . well, you know what comes next. This year, I had a really hard time in Portland. By morning, I was feeling more than a tad blue. Yet something told me it wasn't over, to just keep my heart open. Just before fajr, Sidi walked into the room and sat down. This beautiful beloved, Ra'uf (why are all the Ra'uf's so beautiful? ), sat down next to him. As it turns out Ra'uf was following his own picture, imagining Sidi to be lonely and in need of company. But I didn't know that. I was thinking, "Hey, I want to be with my guide too. How come he feels free to walk right up and sit down with Sidi and I don't?" Just then, I felt Sidi's words "Take your chance!" move in my heart. I stood up tentatively. As I did, Sidi looked right at me and raise his eyebrows in what seemed an invitation. I moved a few steps in his direction and meekly said something like, "Sidi, may I ask you a question." He responded with a long, soft, "yeeees." I said, "Sidi, I had such a difficult khalwa." He said (ever so gently), "Yes, it is in the nature of the human being to listen to shaytan." Something very deep in my heart moved. Wow, it's as simple as that I thought; of course, I've been listening all night to shaytan. I looked inside again and said, "Sidi, was I not generous enough?" Having just given up my law practice to relocate, and having not developed a new one yet, I've been careful with money. But in truth, I've always been fearful of not having enough. He said, "Allah accepts whatever you give." Then he said, "The more you give, the more you can open your heart, the more Allah-he can give back." The transmission was one of overwhelming mercy and kindness together with complete freedom, love and acceptance. Then we prayed fajr. During the prayer, the words penetrated deeply. Before I knew it, I was crying and crying and crying. Ya Allah ar-karim. Sidi has a few remaining stops on his schedule in the United States. He's going to be at the Farm of Peace (a truly peaceful, extremely rural place not far from the great cities of the Northeast), in South Florida (a region I've not yet seen but I'd love that to shift -- perhaps next year, insha'llah), on the Land for the various University classes (with community members invited to be present for Sidi's teachings), and in San Diego. All of them will be wonderful I'm sure. I'm so looking forward to being with other beloveds this year. There are so many I haven't seen in ages. God only knows who will be there. For those of us who have been around awhile, Sufi School is always a reunion; a big, loving gathering of family, extended in geography but close in heart. For those who are new, it's a chance to be welcomed into this amazing community and to take hands with Sidi (as your guide) if you feel so moved. For all of us, it offers a huge opening to be with Allah. Sidi will be in San Diego from November 11th through the 14th. It's a full Sufi School event, with not only Sidi's teachings (which are for everyone) but also separate teachings by our wonderful USHS faculty, each more amazing than all the others, both for newcomers, designed to gently open your heart, and for grizzled veterans, designed to blow your heart yet again, this time even wider -- insha'llah. I said this last week but it bears repeating. It is such a special gift and opportunity to be with our guide. I remember this one time when I was at the Land, at the University in fact, and I was writing "He Who Knows Himself . . ." I was writing and writing and writing, just about all night, night after night, to try to graduate with my class. In three years of school, I had written 58 pages. I had 100 to make up. I can be pretty lazy. I had given up, figuring it was pretty well hopeless. But fortunately, when I realized my heart was breaking over not graduating with my class, Wadude encouraged me to go for the impossible. "But do you really think I can do it, Wadude?." "Suuuure!" After nights of tedium, one night the book finally opened and suddenly I was receiving the enormity of Sidi's transmission. It went on and on like that for hours. I felt like I could write forever. All day after that, I noticed that we mostly sit around and chat, and I was like, "Why aren't we all writing?" The opportunity seemed so clear, so obvious, so huge. I went up to Sidi and said, "Sidi, I never realized until now how much you give to us. And yet you're so patient and gentle. We take so little of what you offer and yet you keep offering us everything." He said, "Yes, my love. My hand is open, you take what you want." I say this for all of us, myself included. Tune in to what's moving in your heart and say yes to it. There's this great opportunity right before us. A spiritual smorgasbord. It's all right there, and it's for us to be brought near. If you're fortunate enough to find it moving in your heart to get up before Fajr and do remembrance, great. If you're yearning to open the Qu'ran, wonderful. If it's moving in your heart to fast, Alhumduli'llah. If you're wanting to be part of the community phone calls or to return to the University, take your chance. And if it's moving to be with Sidi, grab on and hold on. The latter seems, to me, particularly precious, for he's 78 years old. Who knows how many more chances we'll have to spend time with him. If Allah sends a spiritual master to guide you home, you're among the most blessed of the blessed. To sign up, go to: https://www.123signup.com/event?id=czfpc and click on the word "Register" in the upper right hand corner of the screen. For first timers, there's no cost. For the rest of us, there is (because it unfortunately costs money to bring Sidi and the teachers to town, rent space and all the rest). Open your heart and ask Allah to help you. If you're supposed to be there but the money's not, don't let that stop you. Sidi wants all those longing to be with Allah to be there. Work study and scholarships are available. At the same time, if you've been blessed with the means to be generous and Allah's moving it in your heart to give more than your share of the cost to help make up for those who can't, alhumduli'llah! For everyone except those in need of work study or scholarships, sign up at the website. Those who need work study or financial help, please contact Said and Saida Zimmerman at larryzimmerman@q.com. Discounted rooms are available at the Hilton del Mar. Call (858) 792-5200 and ask for the Southwest Regional Shadhuli Sufi Center rate. The price should be $99 for 2 people and $10 more for each person over that with a maximum of 4. If you have trouble getting this rate, keep asking to speak to someone further up the chain. Hakima says it will work. If it doesn't, e-mail me and I'll inquire further. To find out about the possibility of staying with beloveds in the area, email or call Amina Lyn Ryan at lynryan@skyviewmail.com or (435) 313 3106. Really hope to see you in San Diego if it's right for you to be there. As-salaam alaykum.